CM: Athina Hadjiyannaki's Knight belongs to a series of works made in the period 1994-1997. These artworks are anthropomorphic as variations of the human situation and resulted from a negotiation of thoughts, feelings and initiatives. The materials are found and selected at random. Characteristically Hadjiyannaki says: "The eye by experience chooses materials, which may attain expressiveness depending on their use. The sculpture began to form from the collection of its constituent materials, at the time material was chosen from the piles depending on their usage. In the workshop, materials determined the sculpture, without preliminary study. Thus the creative condition was becoming an exciting adventure." The Knight makes the classical gesture of greeting by his right hand, with which he presents himself to the viewer. His thorax is triangular and flat like armour. This aspect endows the Knight his Doric dimension, meaning hardness, rigidity and immobility. The hand starts from the straight arm and capitulates in a delicate spiral that reflects the path the hand follows during the gesture of greeting. The spiral is foremost an Ionic element symbolizing life, movement, flow, grace and depth. Thus a powerful contrast is formed between martial courage and fine manners. Various mechanisms decorate the Knight's body like lace. 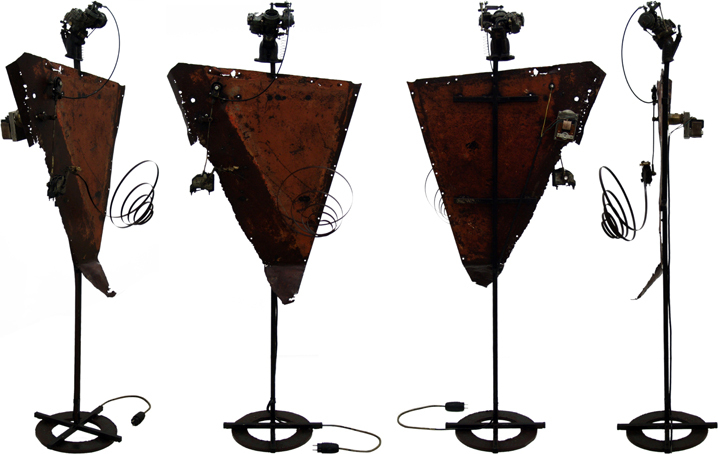 At this point the work of Hadjiyannaki is reminiscent of the art of Jean Tinguely (1925-1991), though the former is concerned with sculpture as presence rather than construction. Hadjiyannaki is interested in how the sculpture may come to live in front of people and the surprise it may cause them. That is why the Knight combines the primitive appearance with the polite gesture of the hand. Indeed, Hadjiyannaki made sure to connect mechanically the hand with the head, as if to remind that salutation requires thought.